These aren’t your grandpa’s barbershops. Barbershops are hot right now because they go way beyond the buzz cut. Today’s barbershops are hip spots to socialize, get the latest short cut and be pampered head to toe. While barbershops definitely cater to the man, women desiring short cuts are often welcome into the chair. The demand for the ultimate barber experience has made barbering the fastest growing profession in America, according to Forbes Magazine. 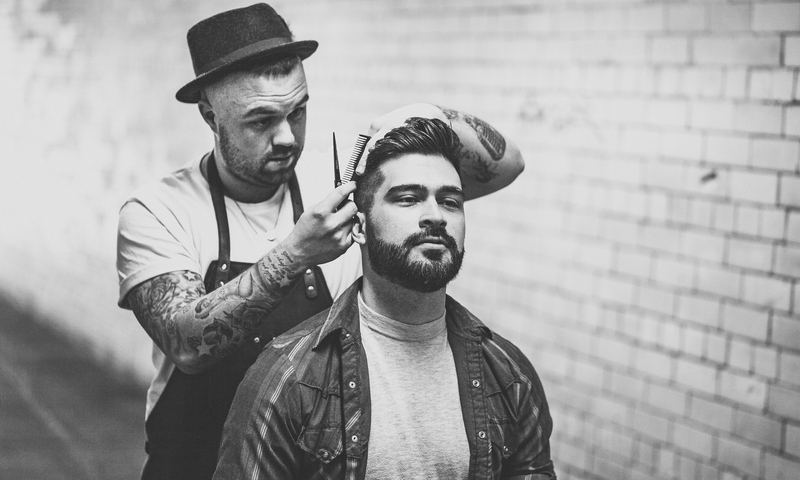 Barbers train on short hair, keep up with the latest men’s signature cuts and are especially adept with clippers for the cleanest of lines. Cutting short hair is what they do day in and day out. So if you want that zero fade, pompadour, undercut with wave or modern Hollywood part with length on top, book a barber. Some barbershops have their own specialties, focusing on rockabilly style or African American hair. A good barber knows what’s best for you, even if you don’t. The pro will make suggestions based on your hair and your head. Check the barber’s portfolio and Instagram for style inspiration. Barbers will trim up your beard, style your crazy ‘stache and give you the closet shave you’ve ever had. Straight razor shaves are not just about the blade technique, but also the preparation and after care barbers provide. The hot towel treatment followed by a lather of thick shaving cream (often warmed before application) softens the skin and prepares the follicles for the close shave of the straight razor. Some barbers add moisturizers with aloe to calm the skin after the shave. Because the barber does cut so close, straight razor shaves are not recommended if you have curly hair susceptible to ingrown hairs, or eczema, rosacea or seborrheic dermatitis. If you want pampering but a spa is not your style, the barbershop will treat you right. While every shop is different, the hottest barbershops focus on treating every customer like he is king. That means hot towel steams, scalp massages and the game on the big screen. Some barbershops offer ice cold beer while you wait, while others are equipped with full bars. Order your favorite alcoholic beverage and drink up while you get a manly facial, have callouses removed or get your shoes shined.